I picked up Sally Hansen In a Flurry at a local Walgreens a few weeks ago and wondered how similar it was to Cult Nails Living Water, so I both to show today. 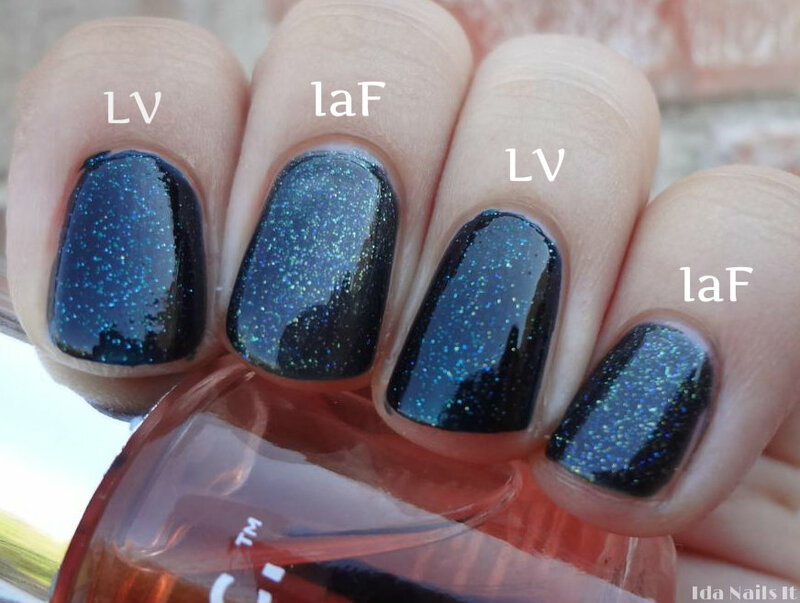 Living Water is a polish that is beautiful in the bottle and translates just as well to the nails. 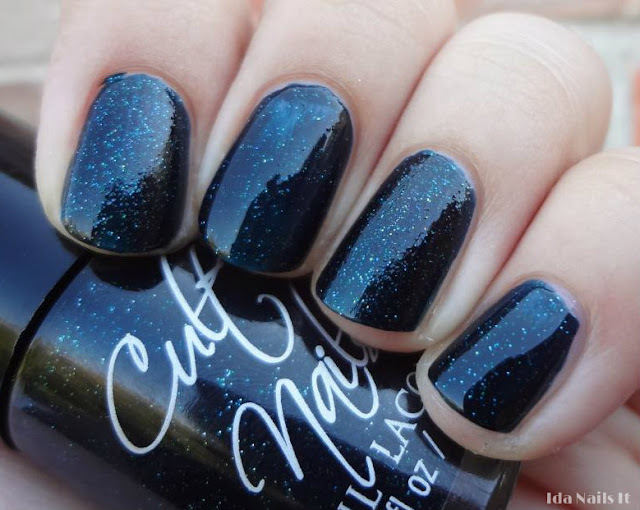 It has a dark teal blue jelly base with tiny blue and green glitter. This was two coats and applies well, though it will have a gritty finish so at least two coats of topcoat is needed. I rushed application, so there is a some dragging, I apologize for that. In a Flurry has a dark teal base but it's more blackened, less blue toned than Living Water. It's packed with small glitter particles and though there is a purple shimmer, I wasn't able to capture it in the picture. I dislike the Sally Hansen mop paddle brush and very narrow Insta-Dri bottle opening but those are things that are tolerable when the polish is pretty enough. In the photo below, Living Water is on my index and ring fingers and In a Flurry is on my middle and pinky fingers. The bases are similar but the real difference lies in the glitter. In a Flurry is filled with more glitter in varied colors compared to Living Water. I used two coats for full coverage for both polishes. They are not close enough to be called dupes but they are close enough to each other that you may not need to own both. Living Water is a limited edition polish but it's still available on Cult Nails web store. In a Flurry is a limited edition polish from the Sally Hansen Insta-Dri line and can be found at various drugstores.